Give your pet’s skin, coat and immune system a boost with American Journey Wild Alaskan Salmon Oil Liquid Dog Supplement. 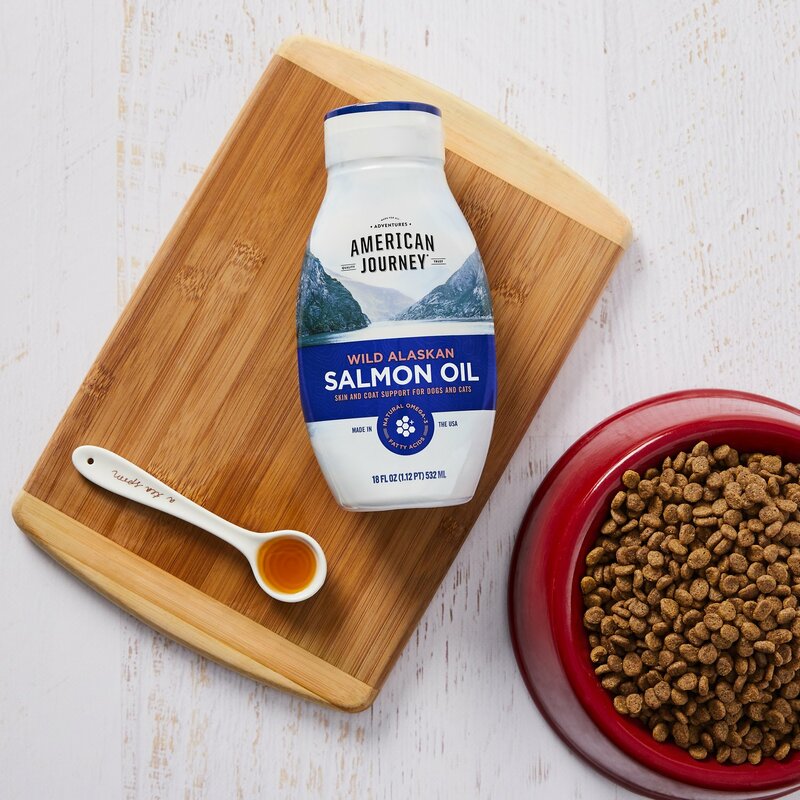 American Journey is made with wild-caught salmon, which contains long-chain omega-3 fatty acids like DHA and EPA that help promote skin and coat health. EPA and DHA are also known to help offer some relief for pets with itchy or sensitive skin. This liquid supplement comes in a squeeze bottle with a drip-free cap, so you can pour just the right amount onto your pup or kitty’s meal—much easier than messy pumps. She’s sure to love it, and you’ll love the benefits. For your pet, American Journey Alaska Wild Salmon Oil has a tasty flavor dogs and cats love, and it’s made by a company that’s proud to be a true American brand. An efficient source of natural omega-3 fatty acids, including long-chain omegas like DHA and EPA that can help support skin and coat health. American Journey Alaskan Salmon Oil is made with wild-caught salmon, the preferred source of beneficial long-chain omegas. Convenient squeeze bottle with drip-free cap makes it easy to add this liquid dog and cat supplement to your pet’s food at mealtime. This product will retain its integrity for 6 months after opening if stored in a dry area at 86°F (30°C) or below. Keep refrigerated for optimum quality. Feed (1) teaspoon per 10 lbs. of body weight daily. Best if mixed directly with food. This product is intended for intermittent or supplemental feeding only. Shake well before each use. Dogs can't produce their own omega-3, so they have to get it from their daily meals. Fish oil, especially salmon oil, is one of best ways to supplement omega-3 into their diet. American Journey uses only wild-caught Alaskan salmon to nourish the coat and boost the immune system. The omega-3 in American Journey Wild Alaskan Salmon Oil helps support your pup's skin and coat health. Salmon oil can be extremely beneficial for pets with itchy and sensitive skin or those battling occasional allergies. American Journey Wild Alaskan Salmon Oil comes in a liquid form. The convenient squeeze bottle offers a drip-free, mess-free cap so your pet's healthy dose of omega-3 goes right where you want it, in his bowl. Your pet's kibble probably has omegas listed somewhere on the bag. But not all dog foods have enough of this fatty acid. Supplementing your pup's regular food with just a little salmon oil each day will give him all the omega-3s he could be missing out on. This stuff does smell bad. If you spill it, use something disposable to clean it up with. We used a washcloth and the entire load of laundry had to be washed three times before the smell came out of everything. HOWEVER, It works great. My German Shepard puppy LOVES this stuff. If I put food in her bowl she’ll sit in front of it and wait for me to pour some salmon oil on it before she will eat. Definitely makes her eat more, and now I feel as if I have to continue buying because I’m not sure she would eat without it. I have also noticed a decrease in her scratching and chewing on herself! I have 10 dogs, all rescues. I started buying this specifically for my two 14 year old boys that I recently switched to homemade food die to tummy issues. Then I started adding it to my 15 year old pit's food for itchy skin and arthritic hips. It helped them so much that I just started giving it to everyone. They all LOVE this stuff!! I love the results and the squeeze bottle! The smell is quite tolerable. I put on 2 bottles on autoship and would very much recommend this to anyone with dogs! The BOGO sale on this is a great value. My dog loves the taste and his skin always seems to do better when he's taking a fish oil supplement. The bottle is nice compared to another product with a pump that I've used in the past. It got pretty messy. The only improvement that I would make to this product would be the addition of some sort of measuring cup. I have a large dog so measuring out 8 tsps a day seems a little tedious. I don't smell like fish! OK, it's a little greasy if you get it on your hands, but nobody's perfect. And it very very faintly smells like.. Something, but not the aquarium section of the pet store. Best of all, it's helping my cat. He's really itchy and loosing fur, and I can't justify throwing away a 70$ bag of prescription cat food for itchiness, as long as he isn't hurting himself. But despite the itch, HIS FUR IS GROWING BACK. It's been missing (with no itch) for months. And it's growing back! This stuff is amazing!! No stink, and fur!!! I add 1-2 tspn(s) to Meow Meow's dry kibble every two days, and he loves it! He gets so excited when it comes to meal time, and after using this Wild Alaskan Salmon Oil for three months now, Meow Meow's coat glistens & is softer than ever! So happy we got the bogo free deal! What a great way to slip in some "good stuff" for our kitty's health & well being! Thanks, American Journey & Chewy! I like the squeeze bottle. I bought the large size and had no concerns with leakage. I use as a topper for my dogs food. They love it so far. They have only been on it for about 2 weeks. My dogs don't smell fishy to me. I'm hoping it will help one of my pups that has itchy skin this time of year. So far everyone seems to have a nice shine and softness to their coats. Not sure if that is from the oil yet. I will continue to use, this is a great size and price on Chewy. Did not help my Nova. Sadly, this product did not help my Nova with her dry flaky skin. I purposely waited almost a full month before reviewing this product so I could give it an educated review. My nova has had dry flaky skin since we brought her home in 2017. I tried salmon oil but I did not see any improvement at all in her dry flaky skin. She is jet black so it is really obvious on her. Shes like a black snow globe. I donated the remaining fish oil I had, because she also didny really the taste of it, I had to mix it with table scraps for her to overlook it. Chandler is 14 years old and doesn't have as much pep in his step as he used to. I had been giving him glucosamine supplements. His vet said that studies have shown that the omegas help more with aches and pains than glucosamine does. We do a squirt on his dry food (twice/day) and he loves it! He does seem to move better, but he was a healthy 14 year old (lab/shephard mix) to begin with. I have this on auto ship. My dog has severe food allergies causing him to lose hair on his eyes and ears. I have been using this product about 3 weeks now and both my dogs love it i bought it for my boy who has the problems hoping it will help with skin and coat. So far it has improved his hair nothing growing back yet but hope for better over all skin quality. His swelling has went down and his itching. We will see what happens in the next few month but i will be continuing to buy this product. The salmon oil is great it's the pour spout needs to be change. When I pour it into my dogs food and stand the bottle back up it runs down the side of the bottle. It's also hard to control how much I'm putting into their food. My 3.7 pound dog only needs a few drops. It's hard to measure without getting to much in the food. I just take the whole cap off and use a spoon.